After an exhausting summer where I had to work overtime more times than desired, I was able to wheedle out of my boss a Friday off for the Mid-Autumn Festival. As a result I ended up with a nice four day weekend. 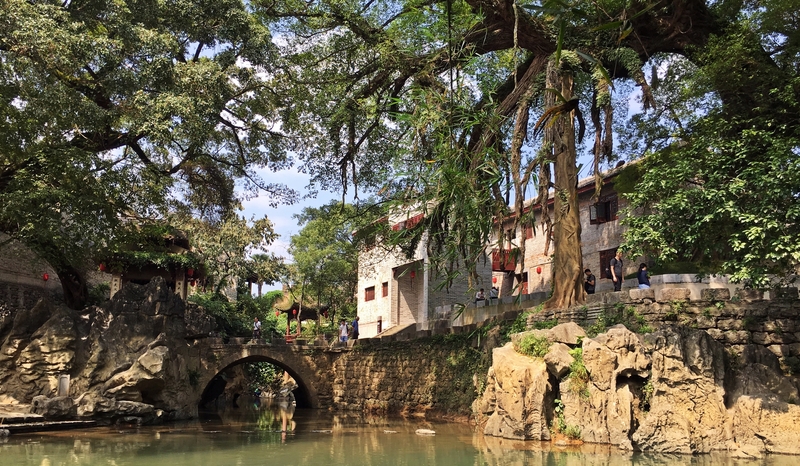 Jun and I decided to leave Guangzhou and go to a village in Guangxi province: Huangyao. While not necessarily the most exciting of places in China, it was perhaps one of the most relaxing and picturesque places I’ve been to in China. To get there we took the train from Guangzhou to Hezhou—the nearest city with a train stop to the village. From Hezhou we took a bus that went through the countryside to get to the village. It was quite pretty to drive through the mountains. When we got to the village it was already late in the afternoon. We walked along the main road next to the village and went to find our hotel. The hotel we stayed in was originally an old village house. It had a rustic feel to it and was quite cozy. After cleaning up and settling in, we went for a walk around the village to find some food. We found this nice little restaurant on the main street that served some of the local delicacies. It was a simple and delicious meal. After dinner we walked a little and found a theater that was having a performance for the Mid-Autumn Festival. They had light displays on the outside and performers in the courtyard dancing and playing music. Children were weaving around their parents as they were trying to see the performers. It was festive and fun. We walked a little ways off from the theater and enjoyed the night sky and the stars—something we rarely see in Guangzhou. As it was getting late we went back to the hotel and went back to bed. The next day we woke up late and leisurely went to find breakfast. We decided to have some noodles at an open-air restaurant next the central area. Afterwards we went to explore the village more fully. To be honest there wasn’t any one amazing or extraordinary building or area we had to see. The beauty of the village is that as a whole it had a magical feel to it. The buildings are the same buildings that have been there in centuries past. The people can trace their lineage back generations. The whole in this instance was much greater than the parts, and it is what made Huangyao special. The day was just wandering around the village and finding interesting areas, nooks, and crannies to explore. Along the way we would stop and enjoy the local cuisine. In the afternoon we took a boat cruise around the village and a little ways into the countryside. It was a relaxing and peaceful way to spend our time together. That night after dinner we went and joined the festivities. People were letting lanterns loose into the night sky. It was a clear night so we were able to see the lanterns fly into the sky as the full moon watched them ascend into the heavens. It was wonderful and enchanting to watch. The next day we spent the morning relaxing in the village and then got ready to head back to Hezhou. We had planned on doing something in Hezhou, but we ended up getting lost and decided to just head back to the train station. In the end it was nicer not having to rush around Hezhou and to just sit and relax. Overall the trip was relaxing and nice break from life in Guangzhou.